VietNamNet Bridge – One of main causes of increasing Vietnamese deforestation is the poor forest land management awareness among concerned agencies, a Ministry of Agriculture and Rural Development official said. 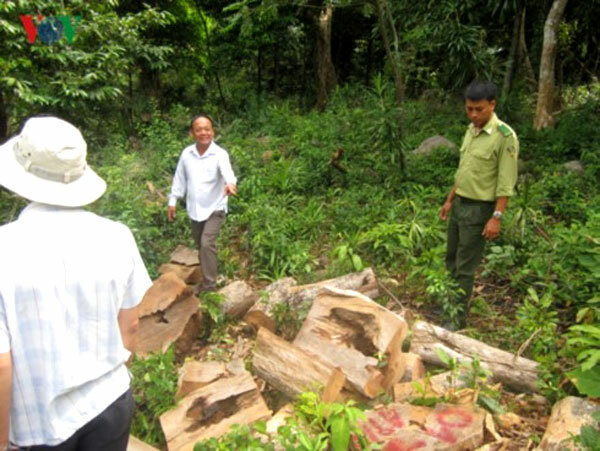 Forest managers inspect a destroyed forest in Da Nang central city. Deputy minister Ha Cong Tuan said some forest managers helped rangers to destroy forests while forest inspectors lacked co-ordination with other relevant forces in protecting forest land and handling violations. To reach the goal of sustainable forest management in 2030, the Government is completing policy, legal documents and action frameworks to reduce emissions from deforestation and forest degradation, according to the deputy minister. Tuan said the Party Central Committee’s instruction to strengthen the Party’s leadership for forest development, protection and management was promulgated on January 2017. Concerned agencies are reviewing and adjusting their forest- and forest land-use planning. Provincial authorities are implementing projects involved in improving livelihoods for local residents. Vo Dinh Tuyen, deputy chief of Agriculture Department, at Government Office, said to manage and develop forest effectively, the agriculture ministry should work with relevant ministries and offices to map out an action plan that highlights the role of local authorities. The agriculture ministry was assigned to review the plan to transfer one hectare of protective forest to production forest. Earlier, the media reported that some 377ha of forest cover, including 273ha of natural forest land in zones 310 and 311 of Song Hinh Commune in Song Hinh District, the coastal south-central province of Phu Yen were destroyed and handed over to the Thao Nguyen-Phu Yen Breeding Joint Stock Company to raise cows. The agriculture ministry is inspecting documents and decisions of related units on the change in the use of forest land that were issued between 2012 and March 2017. Binh Phuoc Province faces increasing deforestation. The province’s natural forest acreage reduced from 127,800ha in 2002 to 58,000ha in 2016. Recently, Bu Dop forest farm’s project to combine growing forest and breeding on 575ha at Bu Dop District was suspended; however, over 100ha of forest was destroyed. There are 14 million hectares of forest nation-wide. Forest cover in Tay Nguyen (the Central Highlands) province has been reducing rapidly. During five years (2010-2014), the forest cover in the region reduced down to 48.5 per cent. Viet Nam aims to increase the nationwide forest coverage to 42 per cent by the year 2020, and 45 per cent by 2030.